Anyone who has driven through Hinsdale over the last few years probably passed by Billy Magnesen at one time or another. “I think I’ve run up Grant Street about 1,000 times in my life,” he says. 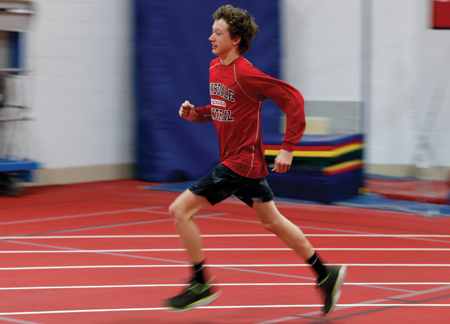 Billy has piled up lots of miles on the pavement as part of his training for the Hinsdale Central Boys Cross Country and Track teams. “The most mileage I ever ran in one week was 76 miles. That was a good week. I probably average in the high 60s,” he says. All of that training and commitment paid off for Billy and his teammates last fall. Hinsdale Central’s Boys Cross Country team raced to its first state championship in school history, topping the Class 3A field with 99 points, well ahead of runner-up Downers Grove North (144) and third-place O’Fallon (157). Billy finished ninth (14 minutes, 41 seconds for 3.0 miles) to lead the Red Devils, who placed four runners in the top 29. “I don’t think I’ve ever felt better than in that (winning) moment, realizing that everything that we put into it had finally come through,” says the distance ace, who placed 32nd at the 2012 state meet. His individual finish put him in elite company. He equaled the best individual state performance in the Hinsdale Central era by Jon Thanos (1982) and John Herbert (1975). Hinsdale High School’s Dave Hahl’s sixth place in 1954 is the all-time best finish. “I’m obviously happy that I was able to be all-state, but that was completely overshadowed by what our team achieved,” says the Red Devils senior, who will run for the University of Illinois this fall.